The name may sound technical, but osmosis is a natural organic phenomenon that occurs in nature on an everyday basis. RO systems force water under pressure through a semi-permeable membrane and a series of pre-filters then into a storage tank that holds the treated water until it’s needed. A dedicated external faucet is included so that the stored water is only used when desired. 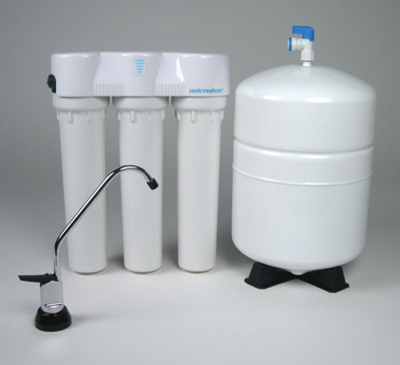 A pre-filter that captures larger particles, chlorine and other substances. An activated carbon filter that takes care of residual taste, odor and additional organic contaminates. RO systems reduce bacteria, cysts, sediment, chemicals, lead & other heavy metals, dissolved solids, chlorine taste and odors. Maintenance includes periodic replacement of the pre-filter, semi-permeable membrane and activated carbon filter cartridges.